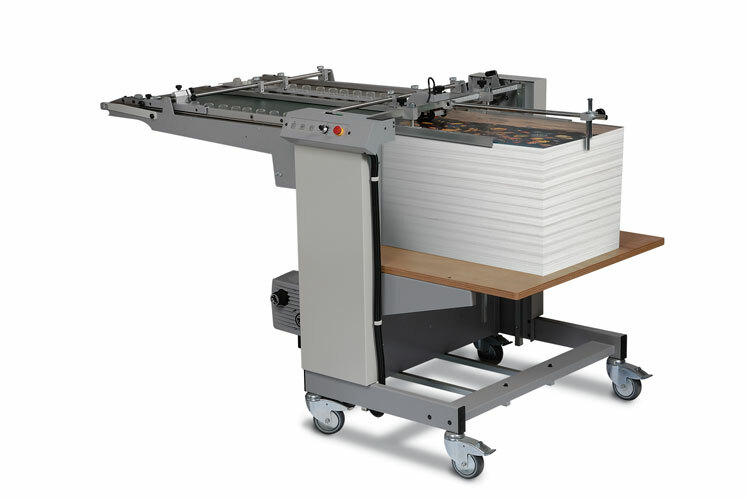 The Sheet feeder is completely self contained and mounted on caster for easy movement. It is precision engineered to a high standard and is quick and easy to set up with a minimum of adjustments. Sheets are separated at the front by blowers and forwarded by a suction drum mounted over the pile. An adjustable tongue front with integral blowers controls the top sheets in the pile. Suction and blow are delivered by a pump mounted on the frame. The pile table is motorized and controlled by a single UP/Down switch. An adjustable limit switch controls the pile height automatically while running. The side lay ball guidance is mounted above a wide transport belt and positioned according to paper size. An independent micro screw enables sheets to be exactly aligned. Controls for main switch ON/OFF speed adjustment and ON/OFF switch for suction roll and belt-drive are located on a central point. Weight w/o Pump 238/450 lbs. Weight / Shipping Weight 320 lbs. / 900 lbs.